WikiLeaks founder Julian Assange arrives at the Westminster Magistrates Court, after he was arrested in London, April 11, 2019. The U.S. on Thursday unsealed charges against WikiLeaks founder Julian Assange in a computer hacking conspiracy linked to the release of hundreds of thousands of secret U.S. documents, just hours after British police dramatically arrested him at the Ecuadorian embassy in London where he had been holed up for nearly seven years. The indictment of Assange stems from one of the largest breaches of classified information in U.S. history, the 2010 WikiLeaks release of a vast cache of U.S. military records from its wars in Afghanistan and Iraq, assessments of suspected terrorists held by the U.S. at its prison in Guantanamo, Cuba, and 250,000 State Department cables. The U.S. accused Assange of conspiring with former U.S. Army intelligence analyst Chelsea Manning, then known as Bradley Manning before declaring herself a woman, to crack a password stored on U.S. Defense Department computers to hack into a government network of classified documents and communications known as the Secret Internet Protocol Network. Cracking the password, the government said, allowed Manning to log on to computers under a username that did not belong to her, initially making it more difficult for authorities to determine the source of the illegal disclosures. 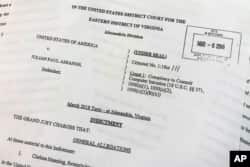 The Grand Jury Indictment against Julian Assange, released by the U.S. Department of Justice, April 11, 2019, is photographed in Washington. The government said that Assange and Manning engaged in real-time discussions as she transmitted classified records to Assange that WikiLeaks then disclosed. During one exchange, according to the indictment, Manning told Assange, "After this upload, that's all I really have got left." To which Assange replied, "Curious eyes never run dry in my experience." Following the exchange, the indictment alleged that Manning accessed the State Department cables that WikiLeaks later publicly released. U.S. President Donald Trump often cheered WikiLeaks during the last weeks of his 2016 campaign for the White House as it released hacked emails reflecting badly on his opponent, Democrat Hillary Clinton. But after the charges were filed against Assange, he told reporters at the White House he knew "nothing about" WikiLeaks and did not have any opinion about the case. Assange, 47, is charged with conspiracy to commit computer intrusion and, if convicted, faces a five-year prison term. A protester looks across at police officers outside Westminster magistrates court where WikiLeaks founder Julian Assange was appearing in London, April 11, 2019. He had taken refuge in the Ecuadorian Embassy in London since 2012 in order to avoid being extradited to Sweden to face sexual assault charges. Sweden later dropped its investigation, but Assange remained at the embassy over fears Britain might extradite him to the United States in connection with WikiLeaks' publication of classified U.S. government documents. British officers said they arrested Assange at the embassy in connection with a June 2012 British warrant for "failing to surrender to court," but that the action was taken after a U.S. extradition request. The police said they were invited into the embassy by Ecuador's ambassador after the Ecuadorian government withdrew Assange's asylum. "Today I announce that the discourteous and aggressive behavior of Mr. Julian Assange, the hostile and threatening declarations of his allied organization against Ecuador, and especially the transgression of international treaties, have led the situation to a point where the asylum of Mr. Assange is unsustainable and no longer viable," Moreno said. He listed a series of alleged transgressions by Assange during his time at the embassy, including installing electronic equipment that was not allowed, blocking security cameras, mistreating guards, and accessing embassy security files without permission. Moreno said most recently, WikiLeaks released Vatican documents, and that before and after the release key members of the organization visited Assange, pointing to his continued relationship with a group "interfering in internal affairs of other states." The Ecuadorian leader also said that in line with his government's respect for human rights, he requested Britain not extradite Assange to any country where he might be subject to torture or the death penalty, and that Britain had "confirmed it in writing, in accordance with its own rules." In a Twitter post, WikiLeaks said Ecuador "illegally terminated Assange's political asylum in violation of international law."